AFghanistan in Central Asia and the Western neighbor of Pakistan has an estimated population of about 28 millions people, almost all of them are Muslims (04/2007), stretches on 652,000 km. 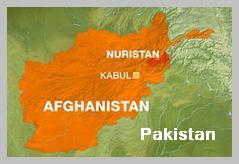 Afghanistan has no access to sea and is one of the poorest and undeveloped countries in the world. The population is speaking several languages but mainly a local dialect of Persian – Dari in the West, that was the official language in the royal court, and in the East Pashtu, the language of the Pashtuns living in Pakistan. Although Afghanistan has a long history of independence and a tradition of defeating, eventually, any invader, the concept of State in Afghanistan is foggy. The country was always an alliance of independent tribes that recognized the unity of Afghanistan and their king was the symbol of the unity. The tribes in Afghanistan were always distrustful to foreigners and united against foreign invaders. In the meantime the tribes in Afghanistan fought each other enthusiastically. War in Afghanistan is very much a way of life. In 1973 the king Zahir Shah was overturned by his Prime Minister, the social order and system that enabled Afghanistan to be a united country collapsed and Afghanistan plunged to a violent turmoil ever since. In 1979 Soviet Russia invaded Afghanistan to support another, so called social, coup which was the start of the Afghan war. USA, through CIA and ISI (military Pakistani intelligence) took advantage of the opportunity to punch the Soviet Union and supplied the anti Russian insurgents, the Mujahidin, with money, weapons and technology to fight the Russians. With time CIA with ISI established a world wide network to recruit Muslim volunteers to fight in Afghanistan a Jihad war against the Russian. The training, military experience, connections and the spirit of Jihad became, eventually, the hothouse for Global Jihad and Al Qaeda. The Russians were finally defeated in 1989 and left Afghanistan. USA lost all interest in the country after the Russian defeat. The different faction in Afghanistan continued, as always, to fight between themselves who will control the country. Pakistan and ISI ceased the opportunity to channel the enthusiasm of the Moujahidin in Afghanistan to the terror campaign against India in Kashmir and supported the Pashtun Taliban against all other, mainly ethnics, groups in Afghanistan. Taliban became a proxy of Pakistan and by the end of 1998 Taliban, with the support of Pakistan, took over most of the country except a Shiite strip near the Iranian border, in the West, and another territory in the North near the borders with Uzbekistan and Tadzhikistan – the Northern Alliance territory. In return the Taliban regime enabled ISI to open training camps for volunteers to the war in Kashmir. The Taliban also enabled Osama Bin Laden, who supported the Taliban with money, to open training camps for Al Qaeda. Afghanistan became the Safe Haven for the Islamic terror and Global Jihad. After The 9/11 in 11/2001 USA used the Northern Alliance to overthrow the Taliban regime in Afghanistan (operation “Absolute Justice”). American special units and air strikes supported the Northern Alliance offensive to take over the country and to establish there a so called democratic system. The democratic system is unacceptable in Afghanistan – same as the Communist ideology. USA or NATO-ISAF forces are regarded no differently than Soviet troops two decades before. Today (04/2007) Afghanistan is again in war against foreign powers in their country and the insurgency gains more and more influence. The war in Afghanistan is no different than the war in Iraq and Afghanis were always very good and determined to fight foreigners on their land.